22 • Textile Insight ~ March/April 2019 textileinsight.com IN THE STUDIO | RETRO REIGNS Heritage Holds On Experts Explain Why Consumers Today Remain So Keen on Retro. By Suzanne Blecher eritage is a term that can conjure many meanings – authenticity, quality and nostalgia. Separately, it can also signify old items and things that are out of touch. In a time of self-driving cars and artificial intelligence, have we not improved upon gar- ments from the 1920s? Textile Insight asked experts for their two cents on the subject: "It's such a fraught time. There's a subconscious pull to better, more comfortable, times. We are overloaded with so much fashion. Things can't stand out on their own because they are lost in a sea of other things. So, it is perceived that things from the past that were in magazines or on television shows when there was less stuff around, seem more singular or important now. Nostalgia is such a driving force. We are experiencing a period that was supposed to be a shiny new future, but we're still dealing with some things we didn't think we would be at this point, like politics, social issues...we are still rehashing things from the 1950s and 60s. Think about racial poli- tics and sexual politics. These are things we thought we made so much ground on and we really have not. We are going back to those old problems." Elizabeth Way, Assistant Curator of Costume, The Museum at FIT "Overall, I continue to see the use of historical informa- tion to directly enhance and protect the company's brand identity by highlighting his- toric themes in advertising. One of the companies I work with (outside of fashion) is a great example of low-key, powerful messaging, using heritage branding to create that crucial emotional bond between company and cus- tomer. People prefer products from a company that has a well- defined image, a clear history and mission – a company that offers a message that they can relate to, value, and cherish... Our reputation as responsible business stewards is built upon seven generations of doing business the right way – being patient, principled partners.'" 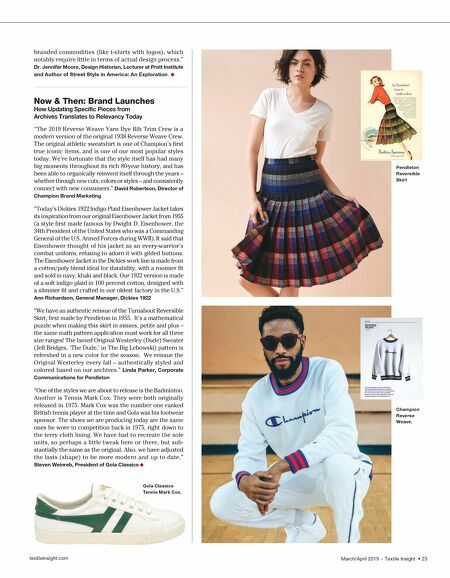 Richard S. Hobbs PhD, Consulting Archivist & Historian for The Winthrop Group, Inc. (Pendleton is also a client) "Heritage brands and revivalism (archival designs) have been key concepts in the luxury sector since the latter part of the 1990s. That said, we could look to other periods and find revivalism of ideas about fashionable dress. For example, post-WWII women's fashions revisited impulses from the 19th century. Societal anxiety and a desire to turn back the clock on the social order and gender roles contributed to the revival of crinolines and waist cinchers post-war. Today, some big companies own a huge number of heritage brands and are trying to make as much product for as many demographics as possible. 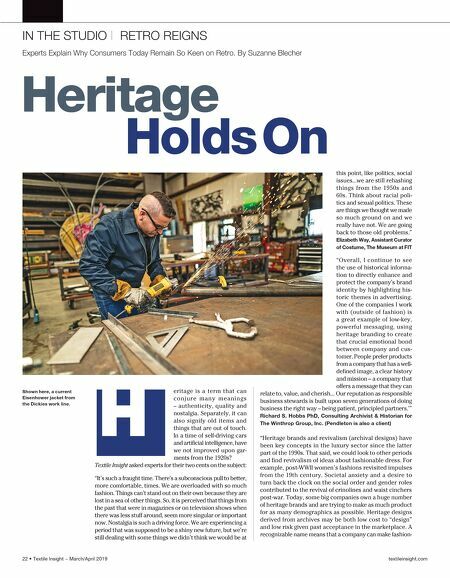 Heritage designs derived from archives may be both low cost to "design" and low risk given past acceptance in the marketplace. A recognizable name means that a company can make fashion- Shown here, a current Eisenhower jacket from the Dickies work line.